Five years, eight months, 12 days…and counting. That’s how long Debbie Ocean (Sandra Bullock) has been devising the biggest heist of her life. “Ocean’s 8” also stars James Corden as an insurance investigator trying to put the pieces together, and Richard Armitage as Kluger’s unwitting date at the Gala. Gary Ross (“Seabiscuit,” “The Hunger Games”) directed “Ocean’s 8” from a screenplay he cowrote with Olivia Milch, story by Ross. Steven Soderbergh and Susan Ekins produced the film. Michael Tadross, Diana Alvarez, Jesse Ehrman and Bruce Berman served as executive producers, with Milch co-producing. 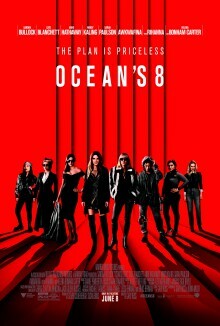 Warner Bros. Pictures presents, in association with Village Roadshow Pictures, a Rahway Road production, “Ocean’s 8.” Opening on June 8, 2018, the film will be distributed worldwide by Warner Bros. Pictures, a Warner Bros. Entertainment Company, and in select territories by Village Roadshow Pictures. This film has been rated PG-13. Join LatinoScoop at an exclusive advance screening of OCEAN’S 8 in select locations below. Click on the link below for your city and enter the code. If you download a screening pass and aren’t able to use it, please share it with someone who can attend. There are limited number of passes available for each location. Screening passes are available on a first-come, first-serve basis. Additional passes will not be added once they are all redeemed. Anyone downloading a screening pass is advised to arrive early to secure seating. The theater is intentionally overbooked by the studio to ensure a full house. Plan accordingly to arrive with enough time.